Find the files you need fast with instant full-text and metadata document searching. Search and retrieve documents instantly using document search technology in Document Locator. Files are easily retrieved with full text searches on content and metadata tags. 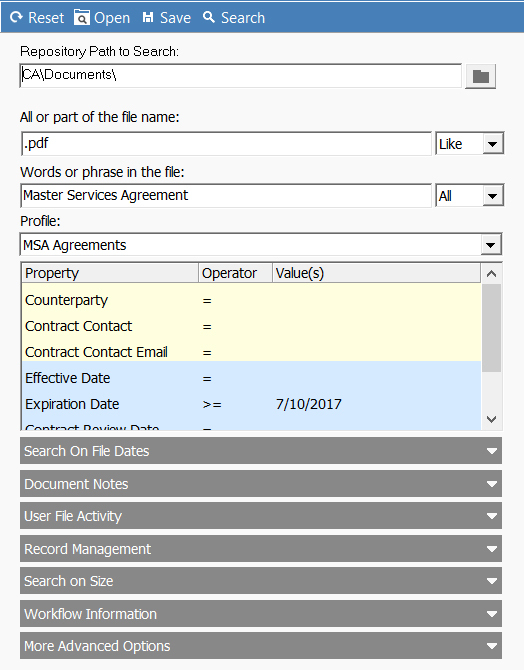 Document search criteria can include any combination of content, properties, or details about a file such as notes or workflow information. All document searches are fast, and results are returned immediately. 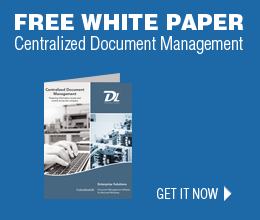 Electronic document searching is a significant advantage over shared-file servers, personal drives, and filing cabinets, where information is often difficult to find. Plus, searches can be saved so they can be re-used and shared with others. Also, document preview technology lets you view the contents of files in search results, even before opening the files. You can even search the content of scanned paper files in the system. Paper files are converted to full text searchable digital documents in Document Locator. OCR (optical character recognition) scanning technology turns print on paper into searchable text. You can search everything by words or phrases in the file, and find exactly what you are looking for quickly. Search files in the system using one of several search tools: quick search, advanced search, power search, or My DL search. Quick search is a handy search tool built into the Windows toolbar and Web browser navigation. Advanced search is also built into Windows and is available in the browser. Power Search extends the ability to search for files in Document Locator from within other applications. My DL allows you to search globally across all repositories. When searching in Document Locator, search terms are automatically highlighted within a file after the file is opened. This saves time, making it easy to immediately find the specific areas of a document where a term is located. Automatic search term highlighting works with PDF, Word, and other Microsoft Office files. Simply perform a search in Document Locator, open a document, and as the document opens the terms you searched for are automatically highlighted. Plus, you can navigate directly to the page where a term is located by using bookmark navigation. Full text search the content of electronic documents, emails, PDFs, OCR scanned documents, CAD drawings, and more. Find documents instantly using a variety of search criteria. Search results are returned immediately. Create searches using multiple criteria across all search categories. Limit document searches to the latest version, all versions, or a subset of previous versions. Search on user-defined profile (metadata) information. Search on file information such as description, status, date ranges, and more. Save custom searches so that they can be re-used, and share saved searches with others.